Like a moose. Tough, strong and nearly unstoppable. Another Cariboo Blades survival knife. A moose browsing in among the willow at -40 and completely comfortable at home. Hand forged carbon steel from the big saw blades that mill the Canadian boreal forest. Inspired by the moose we watch in our front yard. Every November the Moose start to move in. They like to eat our berry bushes and apple trees. We scare them off. They come back. Dogs don’t want anything to do with them. Eventually they get what they came for. Big, tough animals. This winter a year old calf showed up without it’s mother. We shone a flashlight, it turned, left and hasn’t come back. Protecting our stuff. If it shows up again we’ll let it eat. Moose are disappearing from here. Altered habitat from logging, less cover exposes the animals to more predators, more access gives hunter’s the advantage and changing climate patterns; deep snow, no snow. Wolves follow the moose. The winter boreal forest is enchanted. Moose and wolves, ravens, lynx, bobcats, mice hares…As people drift farther away the forest here is out of mind. Custom Handmade Survival Knife for the boreal forest. We carried the Moose knife for several years. Processed moose and deer, peeled rails, split lots of firewood. Tried and tested. 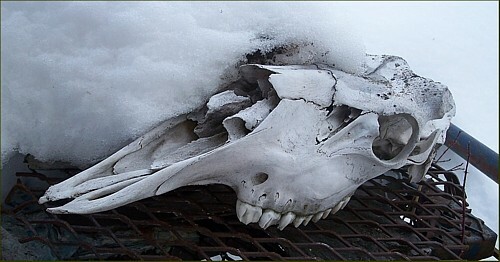 Moose skull. Wolf winter kill. Moose antler crown scales fixed with stainless steel bolts. 7 inch blade with a 1/4 inch spine. Full tang. Hand forged survival knife from the boreal forest. We create a saddle on the spine for more hand power. Use the knife as a draw knife. Battoning to split wood. For more information and pricing go to the Moose survival knife gallery page in our online catalogue.